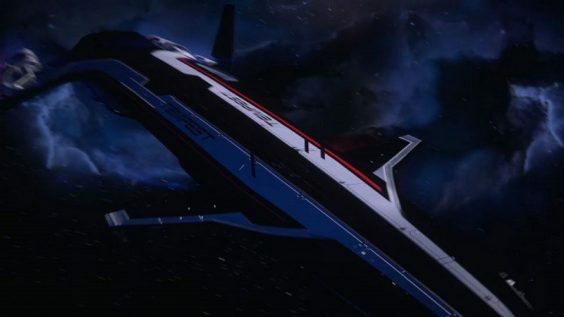 Bioware has tweeted a picture of the Tempest, the ship to be featured in Mass Effect: Andromeda. It appears to be a replacement for the Normandy, Shepard’s ship from the previous titles. In the original trilogy, the Normandy served as a home and base of operations during the story mode. In between missions, players visited the ship to plot their next course of action, purchase and apply upgrades, and catch up with their squad mates. A sleek and swift vehicle, it represented the best technology that humanity had to offer. The Tempest, on the other hand, looks to be quite a bit larger than the Normandy. Aside from sharing a similar art style, the Tempest has a profile that more closely resembles the Star Destroyers from Star Wars. Of course, while the previous ship was designed for scout and reconnaissance within our galaxy, the plot of Andromeda will take players into…well, the Andromeda galaxy. It would fit the needs of the premise for the new protagonist to bring a much more heavily armored ship on their mission. Whether or not the outward appearance will translate to a roomier interior remains to be seen. But those moments spent walking Shepard down the hallways of the Normandy, chatting with the crew and making sure your fish tank was properly stocked are some of the most endearing in any Bioware game to date. A big ship could mean a greater number of characters, and that could make Mass Effect: Andromeda the standout of the series.